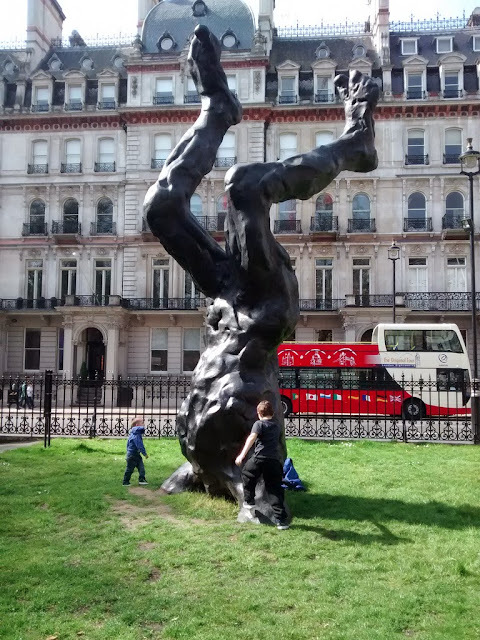 Installed last year as part of the City of Westminster's 'City of Sculpture' programme, David Breuer-Weil's huge Alien sculpture is currently found in Grosvenor Gardens, where it is due to remain until April 2015. The sculpture is cast in bronze and is designed to represent a visitor from a different world, crash landed in head first in the ground, in the heart of London. It features a tiny sign telling park-goers not to climb on it, but it did seem to be rather too tempting for two young visitors when your author popped by yesterday. Taking place today Cottrell House, a disused car showroom in Wembley that is now one of those 'creative hubs' your author keeps hearing about, is the World Women Wembley craft market, an event that promises to showcase all the creative talents of the women of Wembley and Brent, with a particular focus on craft. We are told that it's the perfect place for last-minute Mother's Day gifts, and whilst it does seem that it might be rather too late by the time you get there, it is still might be a good place to take mothers to, and let them browse pretty things from fashion and textile designers, visual artists, dress-makers, jewellery-makers and film-makers, with works on sale from the 'local creative scene'. Tottenham is taking over the V&A this evening, with music, art and debate from, inevitably the area's 'vibrant music scene' and 'creative community'. 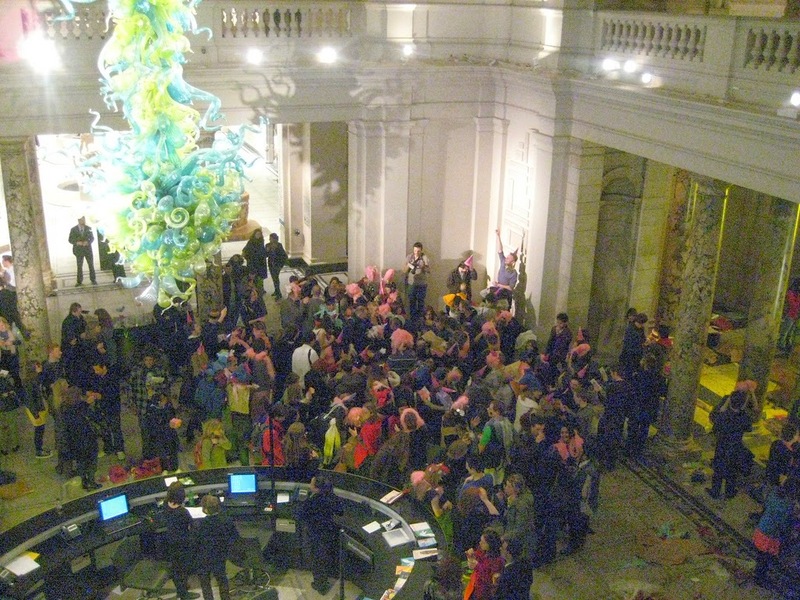 Visitors are told to expect music from Tottenham DJs and the Tottenham Community Choir, art from POST Artists and the HAGA Photo Project and debate on the future of Tottenham High Road and Tottenham style. 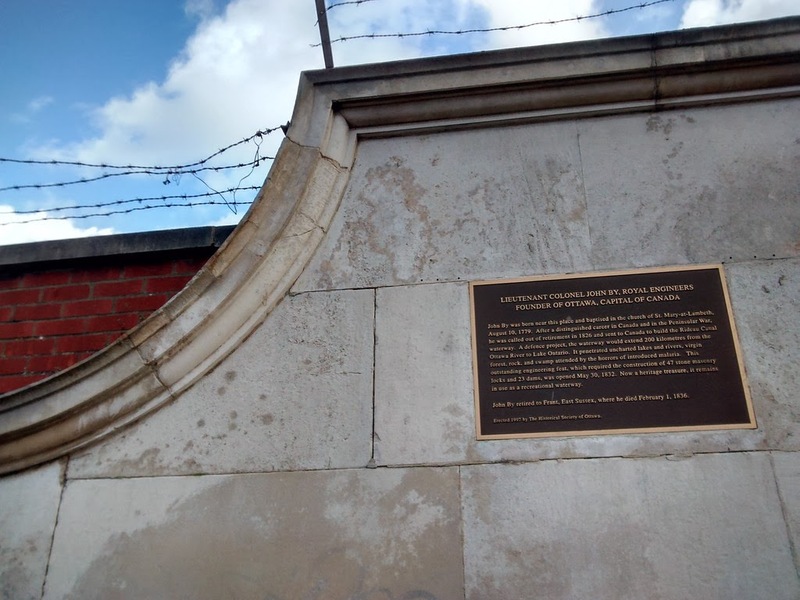 If you've never been to Tottenham, it might be all a bit much, but on the other hand it might be an interesting introduction to the area and it is free. Events take place from 6.30pm until 10pm and it's probably a good idea to get there early if there's anything you're particularly keen on seeing as some are ticketed. Your author has long been a fan of the Pump House Gallery, the art gallery that sits within an original pumping house built in 1861 to supply water to the lakes of Battersea Park, and when he popped in again recently to see what was on, the exhibition showing was At Home, a collection of pieces by artist Hetain Patel. 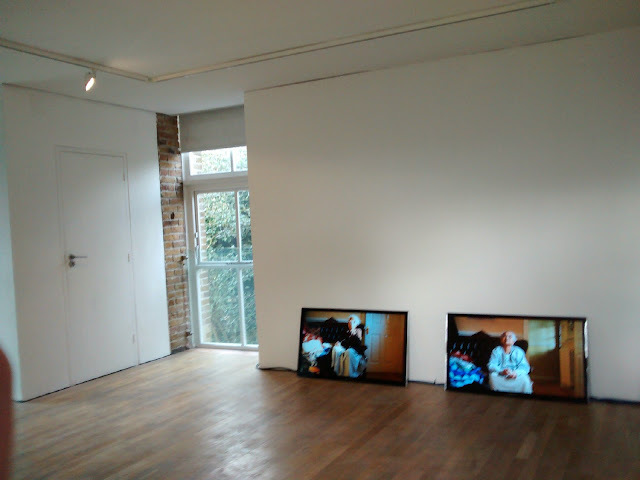 The exhibition is produced by Nottingham's New Art Exchange and is a bit of a mixed bag, with some interesting and thought provoking works, such as videos of Patel’s grandmother completing morning prayers on five separate days and the two animations that show on loop on the ground floor. Whilst your author felt that some other bits missed the mark a little, perhaps this was just personal taste and they were still part of a well-curated exhibition, and worthy of the gallery space. 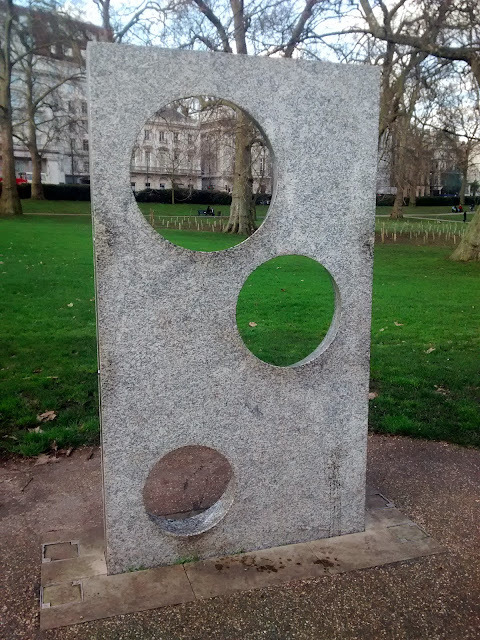 An interesting drinking fountain designed by Robin Monotti Architects and Mark Titman and installed in June 2012, the Watering Holes are cut from an 800kg slab of Cornish granite, and the three holes offer a drink of water for adults, children and dogs, who find themselves in need of a drink in Green Park, via a small hidden spout near the bottom of each circle. The fountain was installed thanks to a gift of $1.25 million from The Tiffany & Co. Foundation which helped to restore and install a number of fountains and drinking fountains the Royal Parks, and Watering Holes was chosen as a design for one of the new fountains. Named after The Priory Park Philosophers, a club for retired elderly men who we are told once met in Hornsey's Priory Park for ‘casual conversation during fine weather’, the Philosophers Garden is a quiet tree-rich spot where dogs are banned and nature dominates. The garden is found at the western side of the Park, and features sculptures, a sundial, a pond and a tree seat. 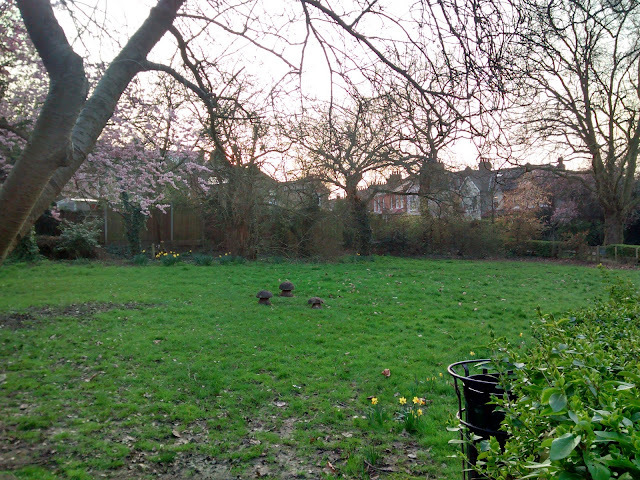 Usually a quiet space, it is occasionally a venue for performances of music and theatre, such as a production of Hansel and Gretel by The Crouch End Players in 2012. Your author had heard previously of London's hairdressing colleges, the promised land of student cuts and free haircuts, but had assumed they were the sort of places where only friends and acquaintances could realistically take advantage of a free cut. 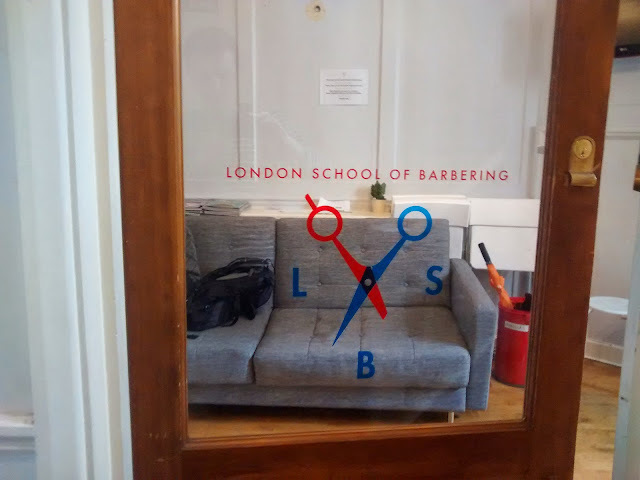 So, it was with surprise recently that he was made aware of the London School of Barbering on Drury Lane, where potential barbers train for a 9 week NVQ qualification, with an intensive 300 hours of training. If you have the time to spend an hour getting your haircut on a weekday you too can take advantage of the School's free haircuts, which were very professional. The student cutting hair last Thursday was on his 7th week of training, and though he stopped twice to ask for advice from a teacher who paced vigilantly up and down throughout, it was only for the sort of extra touches which a normal barber probably wouldn't have even worried about, and the result was excellent. Perhaps the result would have been different from a student on week one, but your author had no complaints. 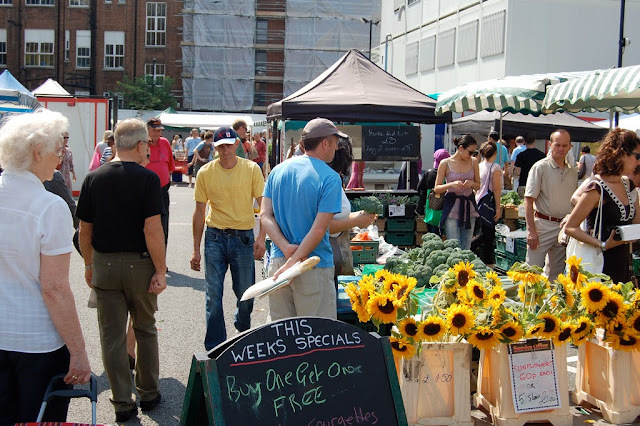 A weekly farmers' market held on Cramer Street Car Park in Marylebone, Marylebone Farmers’ Market boasts between 30 and 40 stalls, with a changing variety of produce and producers on show each week. Visitors are told to expect something for everyone, with meats, cheeses, breads, vegetables, flower and a range of other produce, though you only have to look at the address to realise this isn't a destination for someone with a strong sense of thrift. South London's Dulwich Hamlet have been playing at Champion Hill in East Dulwich since 1931, and it famously witnessed international matches at the 1948 Summer Olympics. It remains an atmospheric ground, with quite a special feeling in the modest stands, where die hard fans mix with occasional visitors for some thoroughly watchable football. This afternoon at 3pm, Hamlet take on Enfield Town, with entry to the ground a very reasonable £10 (or you can sponsor a match including four tickets, programmes, pre-match, half-time and full-time boardroom hospitality for a very reasonable £99), payable at the turnstile on entry. 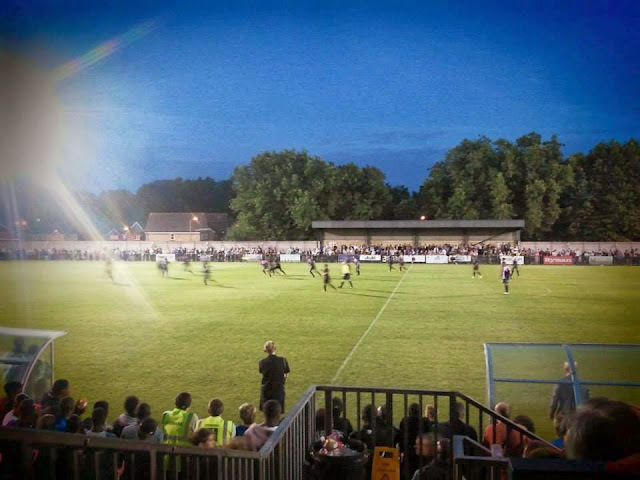 We are told that last time these two teams met, Dulwich Hamlet beat Enfield 4 - 3, so this afternoon promises to be an interesting match, though the home side come into the game on the back of four consecutive losses. 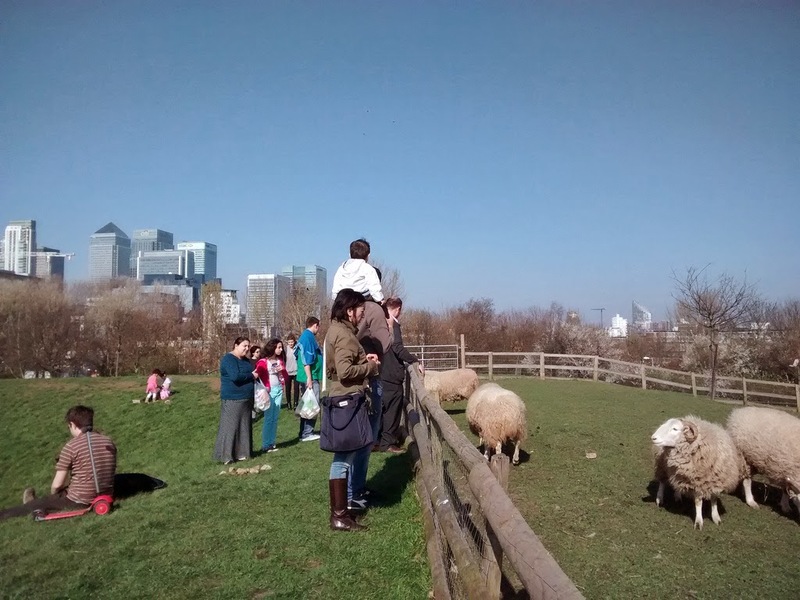 With a total area of more than 32 acres, Mudchute Park and Farm on the Isle of Dogs is one of London's largest city farms, with over 100 resident animals. When your author popped in a week or so ago, visitors and sheep were happily enjoying the sunshine in each others company on the hilltop, whilst a short distance away llamas were stretching their legs. Mudchute takes its name from being a dumping ground for spoil and silt from the excavation and maintenance of Millwall Dock, but it was a place that residents became attached to and when development was attempted in the 1970s, the Mudchute Association was founded to protect it, giving rise to the farm park. Across a number of enclosures, the Farm attempts to educate us city types about what cows, pigs, sheep, goats, horses, donkeys, llamas, alpacas, chickens, geese and turkeys look like in the real world, before serving up a bite to eat at the Mudchute Kitchen. 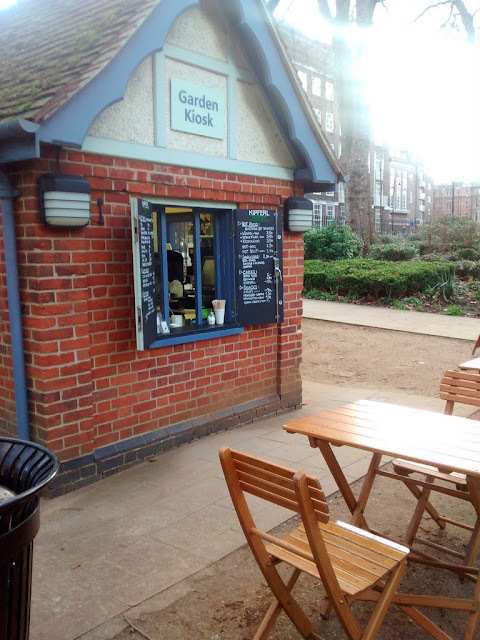 An outpost of Islington's Austrian coffeehouse by the same name, the Kipferl Garden Kiosk in Gordon Square is a tiny little place with some outside tables bringing a slice of Vienna to this corner of Bloomsbury. The cafe is open weekdays only, offering Austrian cakes, sausages and soups from 10am to 4.30pm. When your author visited he had the espresso chocolate cake and it was thoroughly revitalising. Originally commissioned by the British Council for the British Pavilion at the Venice Biennale 2013, Jeremy Deller's English Magic runs until 30th March at the William Morris Gallery in Walthamstow, a venue presumably chosen due to Morris' central role in a large mural showing him throwing Roman Abramovich’s yacht into the Venice lagoon. It's quite a political exhibition, which Deller says in the accompanying video that he hopes makes us mad 'for the wrong or right reasons', and politically-themed items associated with Morris have been chosen from the gallery's collection to display alongside Deller's material, which features houses being burned in St Helier, Jersey in protest at secretive banking and pencil drawings of the likes of Tony Blair and Dr David Kelly drawn by prison inmates who served as soldiers in Iraq or Afghanistan. Whatever you make of the content, it's well executed and the messages are simply and forcefully communicated, and it's free to visit. 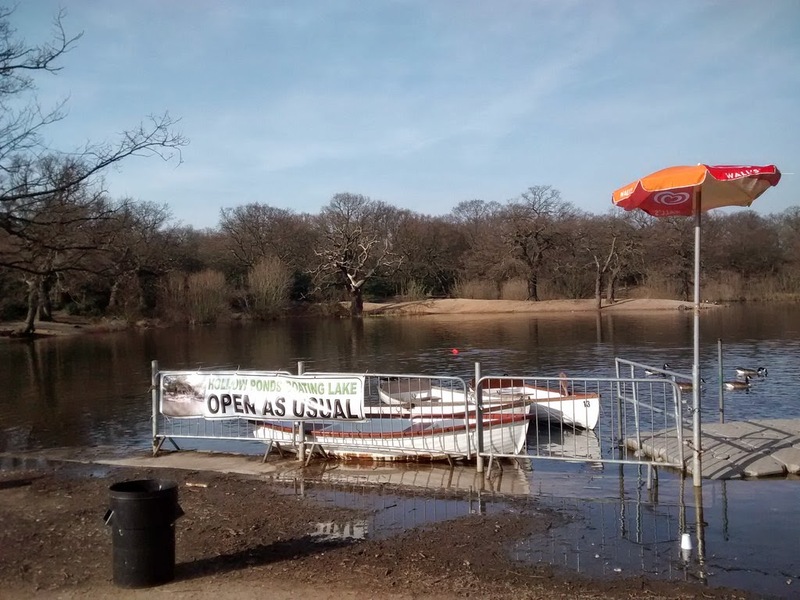 Found just east of Whipps Cross Road on the Leytonstone / Snaresbrook border, a short distance from Whipps Cross Hospital, the waters of Hollow Pond are situated within one of the southern outposts of Epping Forest. 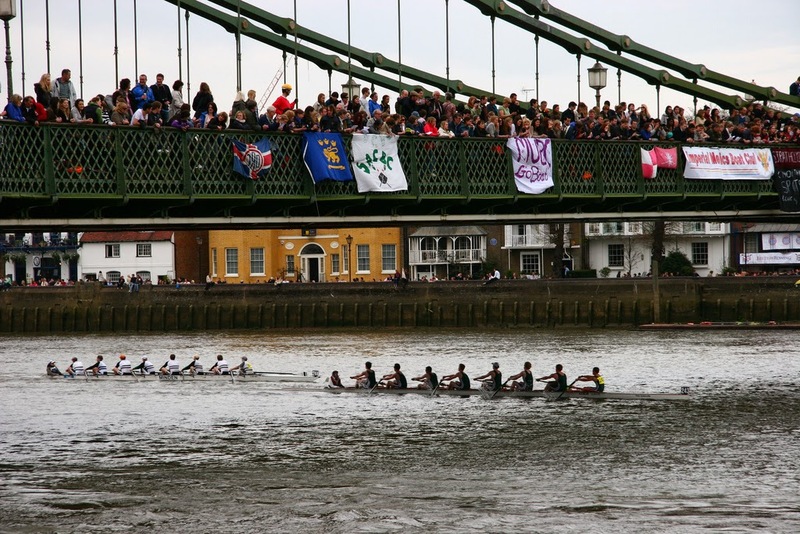 A small jetty offers rowing boats to hire, for around £12 an hour, seating up to five people. A reasonable walk from Snaresbrook and Leytonstone tube stations on the Central Line, the Hollow Ponds were dug as a set of gravel pits, and a bathing pool was added as part of an unemployment project in the early years of the 20th century, fed by natural springs and eventually being developed into Whipps Cross Lido, which closed in 1982. The annual St Patrick's Day Parade takes place today in London, with 100,000 people expected. 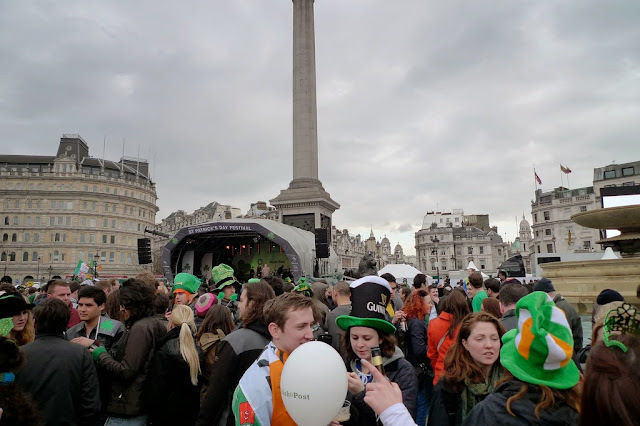 The event begins at noon with a parade which follows a 1.5 mile route from Piccadilly to Whitehall, before a stage in Trafalgar Square offers, we are told, "the best of Irish music, song, culture, arts and dance". This year, that best includes Michael Flatley, Riverdance and actors from the West End musical The Commitments, which in your author's opinion isn't really the best the Emerald Isle has to offer, but we are also promised folk group Kila, and there will surely be some lesser known, and better, acts. 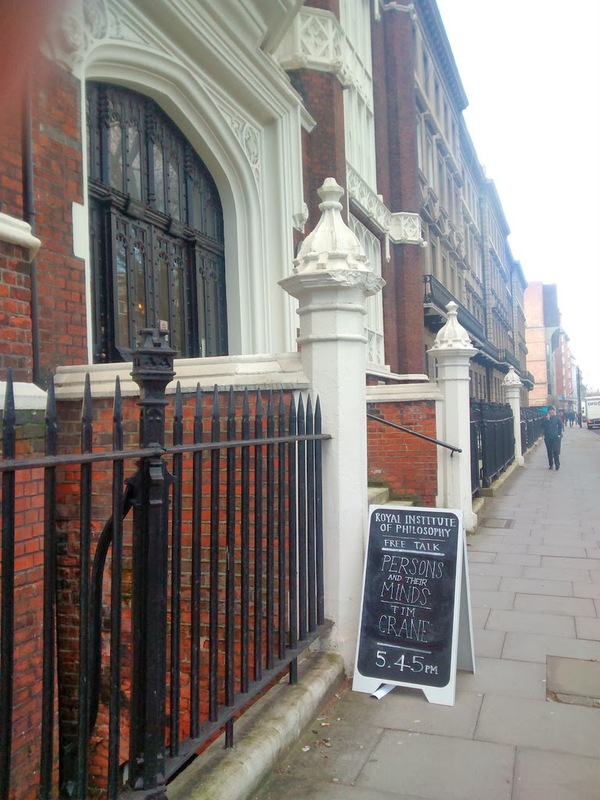 Over at the Church of St Peter in De Beauvoir, The De Beauvoir Association are holding a table top sale today, with the promise of bric-a-brac, clothes, antiques and other second hand items in the crypt of a Victorian church in this area of west Hackney. 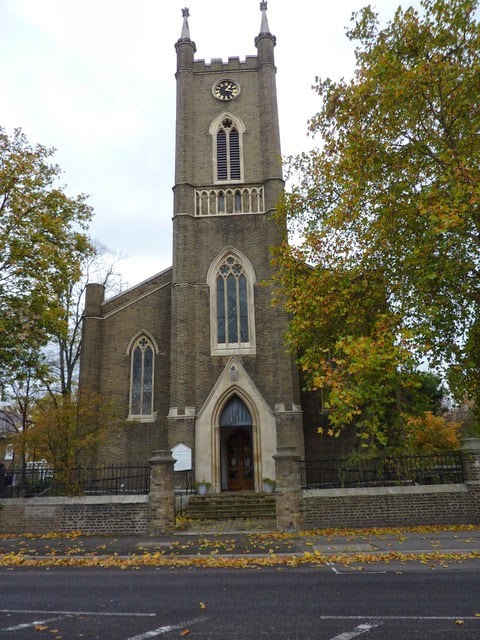 St Peter's Church was built in 1841, funded by Richard Benyon in order to enhance the character of De Beauvoir Town, then a very new area, having been in existence only around 20 years. The crypt where the sale is being held was used as a day school until 1885, when local board schools took over the education. 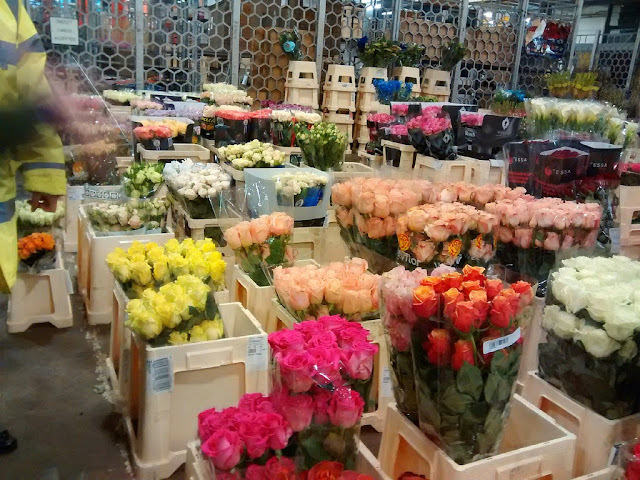 Today's sale takes place from 11am - 4pm. 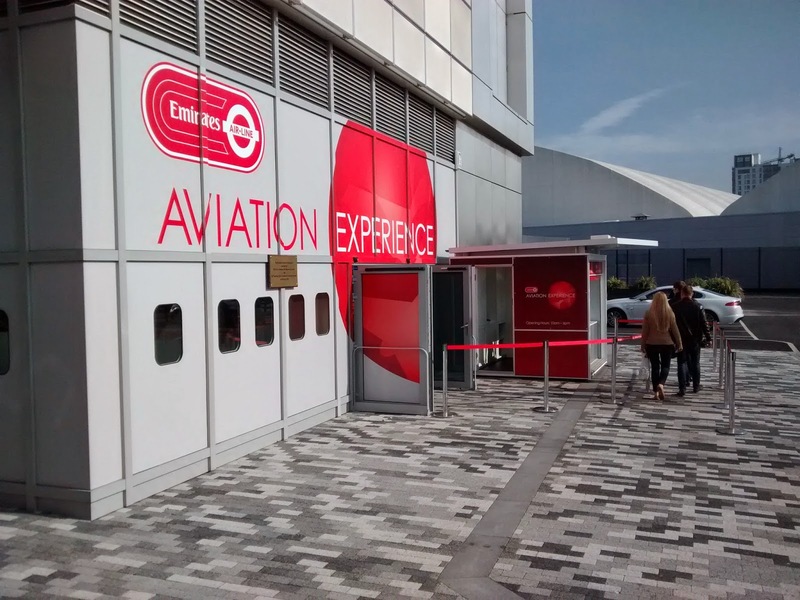 Have you ever heard of London visitor attraction the Emirates Aviation Experience? No, not the cable car, but a place where you can learn about the airline via a corporate experience. 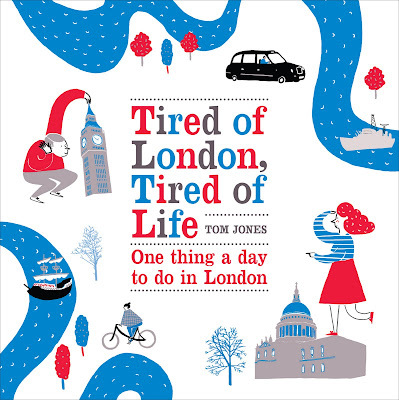 Of course you haven't, unless you've stumbled across it by chance or are slightly obsessive about these things, and neither had your author until he noticed it out of the corner of his eye yesterday whilst topping up an Oyster card at the cable car station. If you haven't heard of it it's probably because it is just a single room flogging the Emirates airline, but in an off-putting move that surely can't cover costs anyway, they charge you £3 to receive this sales pitch. The whole thing probably looked good in the presentation at the creative agency who designed it, but yesterday when your author popped in, it was empty. Whilst the staff were friendly, professional and interested, there is actually very little to do once you're inside the "world’s first Aviation Experience" other than watch promotional videos and have your picture taken in a mock cockpit. There are a number of (empty) flight simulators, but it does not really become clear until you are already inside that 30 minutes on these simulators is a relatively pocket-punishing £45, which you have to go back outside to pay. Otherwise, you are given the opportunity to sit in a aeroplane seat (cattle class), see a Lego jet engine and watch some videos about Emirates before arriving at a gift shop selling nothing you really want. There is an empty cafe, with outdoor seating and then you're off back to the real world. If it were free it would be an interesting corporate showcase but charging for this is a bit silly. Never mind, they do give some funding to a cable car which is good fun and for that your author is grateful. 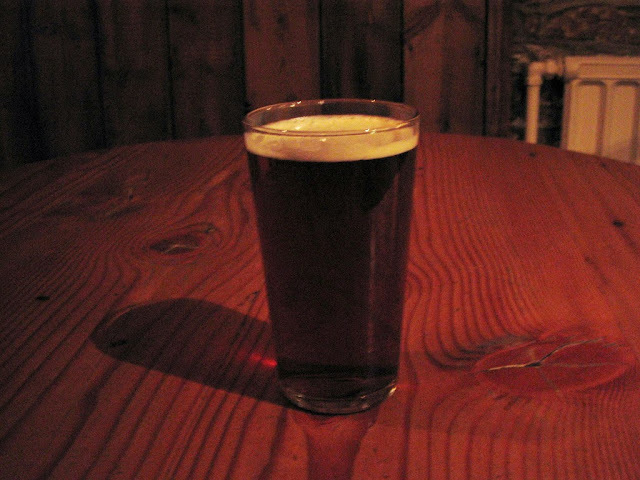 As some readers will know, your author has strong connections with Gloucestershire, so many thanks to Doreen from Five Points Brewing for alerting us to the Gloucestershire-themed Cheltenham [beer] Festival at the Duke's Head in Highgate this week, featuring beer from Uley Brewery, and Stroud Brewery, though sadly nothing from Wickwar. This being trendy north London, the Duke's Head appears to be one of those 'craft beer' theme pubs which are so popular at the moment, but thankfully the genuine Gloucestershire beers on offer are not of the cold fizzy nitrogen-infused types, and it is particularly pleasing to see Chas Wright's Uley Brewery on show, a small place in a beautiful village, run for more than 25 years by a man who knows what he likes and makes it from pure ingredients and fresh spring water, still steadfastly bucking trends by refusing to serve it in bottles. 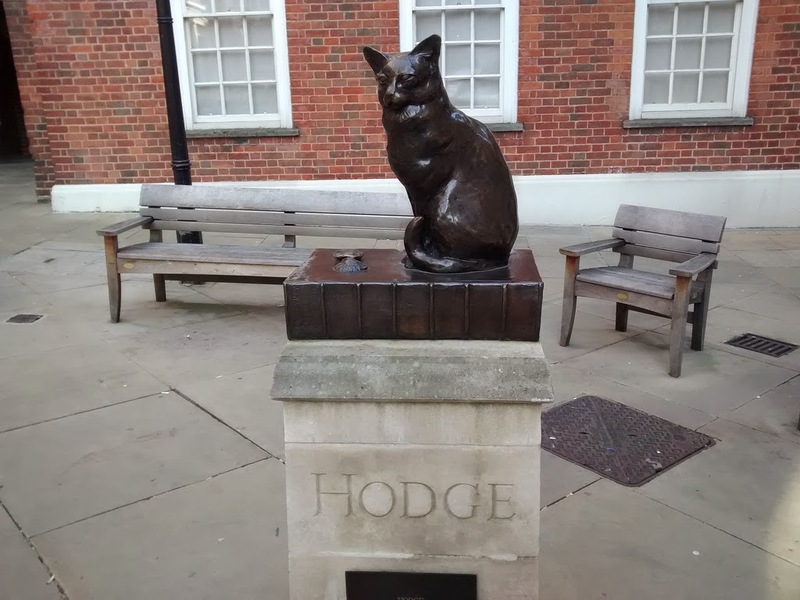 A bronze of Dr Johnson's cat, Hodge, sits in Gough Square, opposite the home of his famous owner, unveiled by the Lord Mayor in 1997. 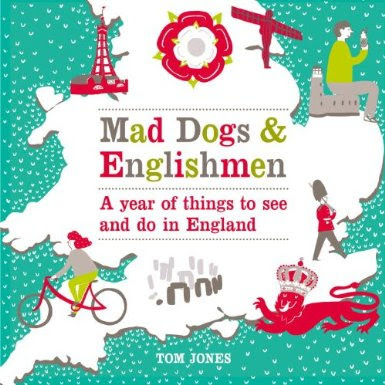 Hodge sits upon a copy of Johnson's Dictionary, with an oyster shell beside him, remembering the food that Johnson would go out to buy for him, apparently refusing to send his servant to do so, as the process might turn them against Hodge. 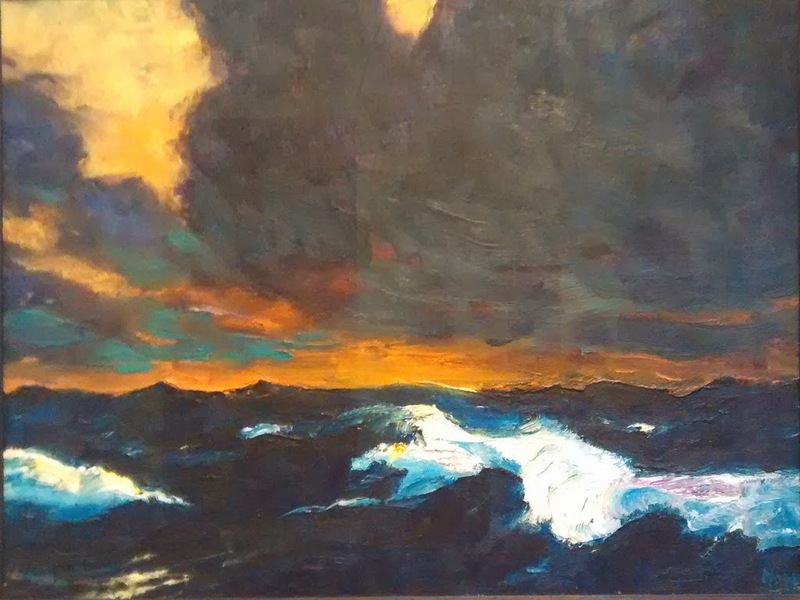 During a couple of recent trips to the Tate Modern, your author has been particularly taken with one work, painted by the German Danish Expressionist painter Emil Nolde during a stay on the German island of Sylt in 1930. A modest memorial on a wall close beside the Thames at the southern end of St Thomas' Hospital remembers Lieutenant Colonel John By, a Londoner and British military engineer who was born nearby and was instrumental in the building of the Rideau Canal, during which he founded a settlement called Bytown, a place to which he gave his name that went on to become Canada's capital city, Ottawa. By was called out of retirement to build the 200km canal, which connects the Ottawa River to Lake Ontario, and it took six years to complete. However, he soon faced accusations of unauthorised expenditure, and though he was exonerated, he died back in Frant in Sussex just four years after its completion, at the age of 56. Alexandra Palace Farmers' Market takes place every week in North London, with 30 to 50 stalls selling produce and up to 2,000 visitors browsing them close to the Muswell Hill entrance to Alexandra Palace Park, or occasionally at Campsbourne School when the Park location is not available. The market has been running since 2001, and is operated by the City and Country Farmers Markets, which organises seven markets across London, with others taking place in Eltham, Hammersmith, Lewisham, Oval, Herne Hill and Stepney. 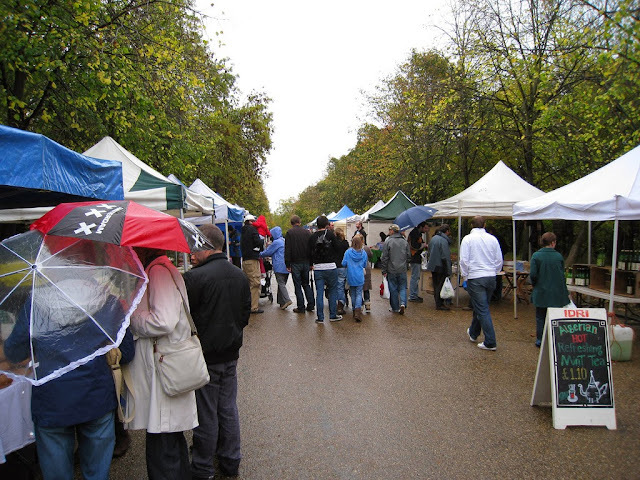 Alexandra Palace is their largest market, taking place from 10am to 3pm with plenty on offer that will make a great Sunday lunch. 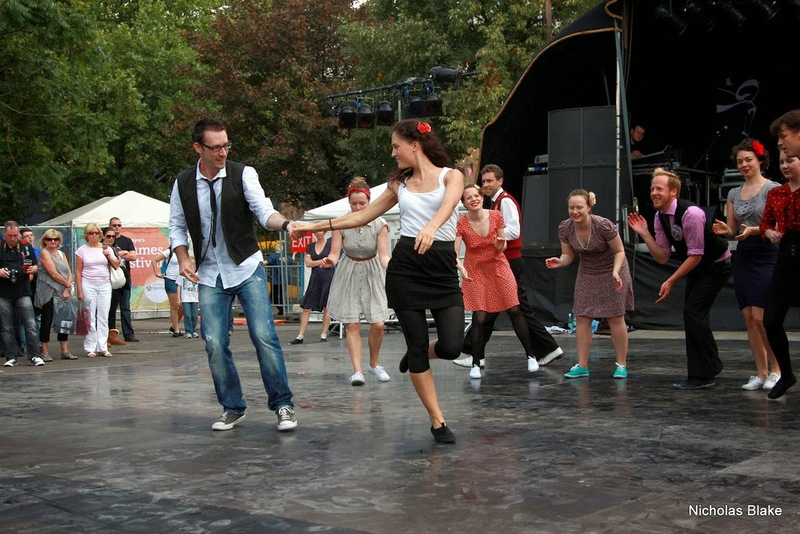 The London Swing Dance Society has been around since 1986, the the UK’s biggest and longest running swing dance club teaching the people of London how to Swing. Tonight, their monthly Saturday Night Swing Club returns to the Magpie and Stump, at 18 Old Bailey in the City, offering three floors of dance and classes. Attendees are advised to "wear [their] best vintage inspired attire", and whilst that doesn't actually mean anything, the dancing and music from the 1930s, 40s & 50s is very real, and even absolute beginners can join a lindy hop session with Caron, though some swing dance experience is probably advisable. 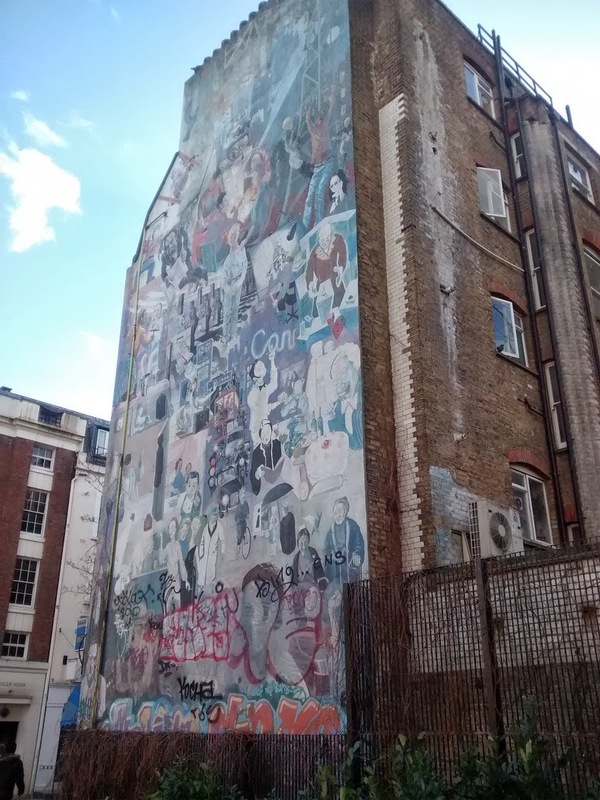 Though it is now a little faded, and has been subject to graffiti on its lower reaches, the Fitzrovia Mural is still an inspiring sight for visitors to Whitfield Gardens, off Tottenham Court Road. Painted in 1980 by Mick Jones (top half) and Simon Barber (bottom half) it stands over 60 ft high. 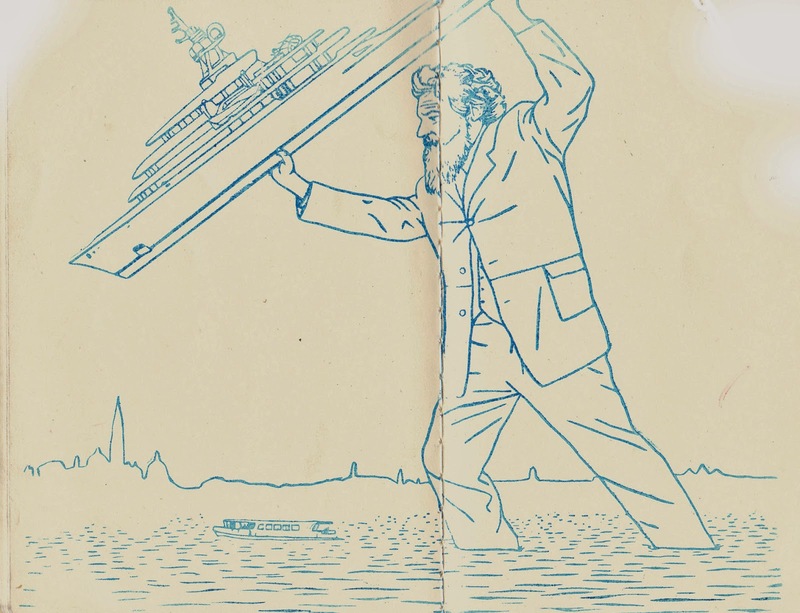 Originally commissioned by Camden Council for local people, the style is said to mirror that of Diego Rivera, and features Horace Cutler, who was then the leader of the GLC, the Post Office tower, a cat, and local workers in offices, people in restaurants, nurses and, apparently, Dylan Thomas. 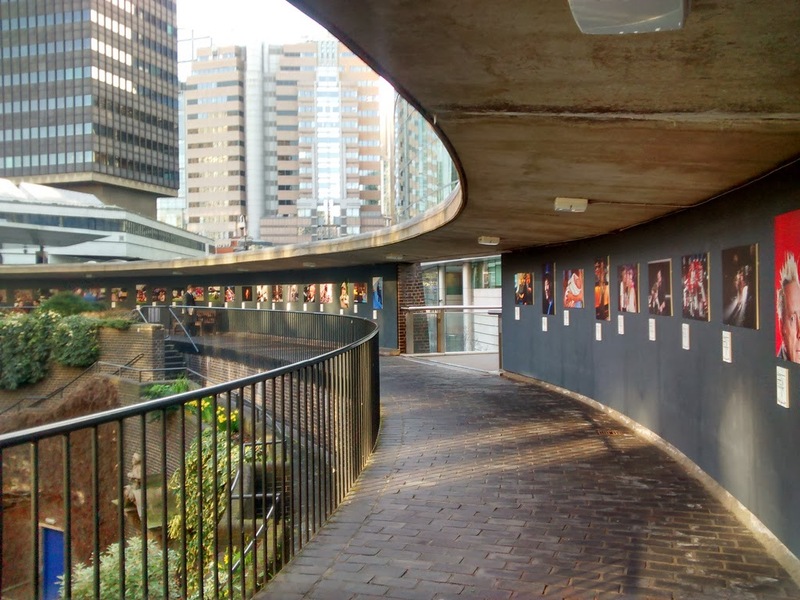 Currently showing in the rotunda outside the Museum of London is an interesting exhibition by the UK Picture Editors' Guild, showing a number of pictures, some of which will be instantly recognisable and others of which are worth a look. The free outdoor exhibition runs until 16th March and offers up pictures by Fleet Street's finest, with awards categories including sports, business, fashion and entertainment, citizen, regional and news, as well as various others. 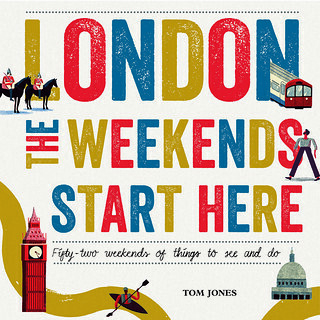 Though a little Royal, Sporting and Celebrity heavy for your author's liking it was nevertheless worth visiting. 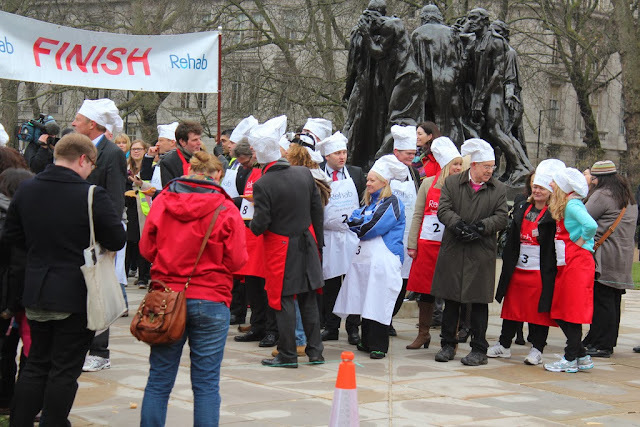 Today is Shrove Tuesday, and there are plenty of pancake races taking place around town, but one that caught your author's attention is the 2014 Rehab Parliamentary Pancake Race, which has now been taking place for 17 years, and kicks off this morning at 10am. 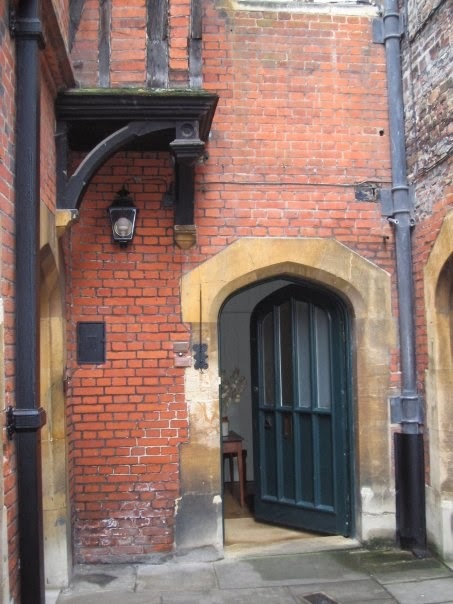 Deep in the heart of Hampton Court Palace, through a door off the network of Tudor brick courtyards that surround Henry VIII’s great kitchen, is Fish Court, a small holiday flat once used by the Officers of the Pastry, which later became part of a grace-and-favour apartment, and is now available to all who can afford to hire it for a stay within the walls of the great Tudor palace. Whilst it is still available to rent by the week through the Landmark Trust charity, it was with some disquiet yesterday that your author discovered that there will be no more bookings available at Fish Court after the end of 2014. There is no explanation as to the reason for this change, or suggestion on whether it will be permanent, and perhaps it is the Landmark Trust who no longer consider the apartment viable, but if you don't want to risk never staying in this apartment just off the tourist route through the palace, a number of chances still exist to book your stay. When your author visited the experience was quite magical, offering plentiful people-watching opportunities from the upstairs window, and even the chance to join the night watchmen on their after-dark patrol around the precincts of Henry VIII's palace. If the passing of the Sochi Winter Olympics has left you in the mood for more things Russian, or at least hasn't put you off Russia altogether, then there's a free festival in Trafalgar Square today just for you. 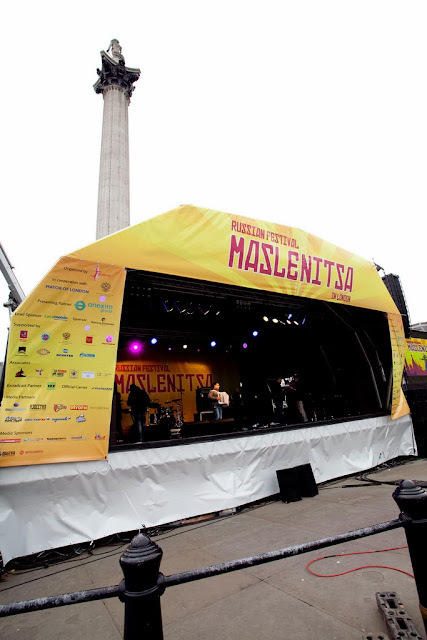 The Maslenitsa Russian Festival offers an onslaught of Russian culture which we are told will feature live Russian folk music, dancing and children’s shows, with plenty of scope for audience interaction. Your author paid a visit to the Global Generation Skip Garden Cafe in King's Cross at the end of last week, and enjoyed a reasonably-priced lunch in a yurt in the garden just to the North of the new(ish) Central Saint Martins University of the Arts London buildings. The Skip Garden is an organic vegetable garden in skips and movable containers on an old bus car park in a quiet corner of what is one of the biggest development sites in Europe, and its cafe is open to all Wednesday, Thursday and Friday 10am - 4pm and the first Saturday of each month. The cafe offers tea, filter coffee and home baked cakes, and lunchtime favourites including vegetable soups and stews, vegetable sides, and specials like macaroni and cheese, and as today is that first Saturday of the month, the 'pop-up cafe' opening will be offering an expanded menu. 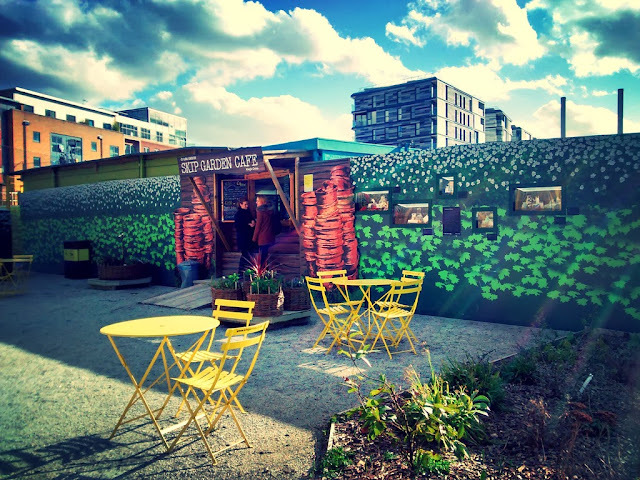 You can choose to eat and drink at tables outside the cafe, or among the plants used to prepare your food in the Skip Garden, or even - in case of inclement weather - in the cosy on-site yurt which sometimes boasts a roaring fire in its wood burning stove.